The Kaltura Media Assignment allows students to submit video, audio, images, or a PowerPoint presentation that is synced with a video or audio. 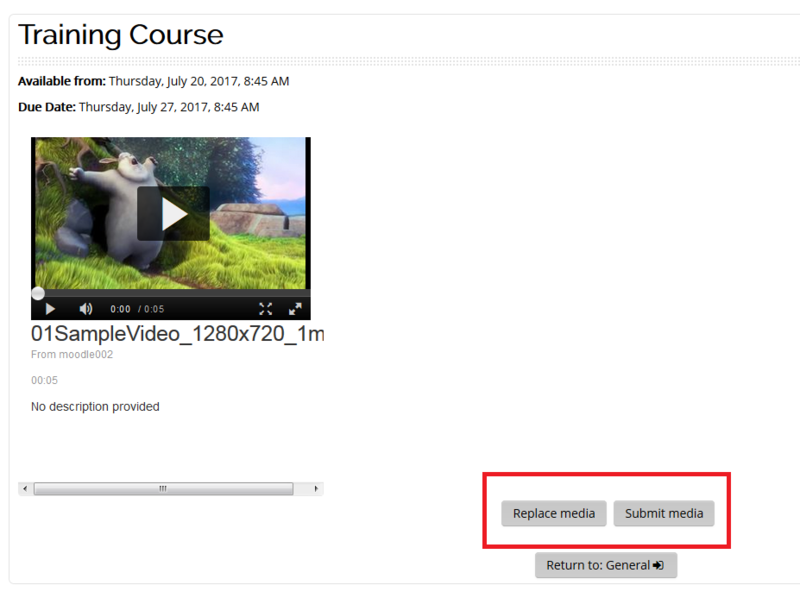 PLEASE NOTE: If you have not already created and uploaded your video/media to Kaltura, see GROK article Add Video Files to Kaltura My Media (Students). 2. Click the Kaltura Assignment in your course. 3. In the Kaltura assignment, click the Add Media Submission button in the center of the screen. 4. Click the blue Select button to the right of the video you wish to submit. 5. The next step is to customize embedded media options. Once you have the settings how you like, click the blue Embed button at the bottom left. 6. You will see a preview of the video. If you selected the wrong file, click on Replace media. When you are ready to submit your assignment, click Submit media. 7. The process is now complete. Click the Continue button to return to the Kaltura Media Assignment. 8. Once your assignment has been graded, see View Your Grade and Feedback on a Kaltura Submission (Students).